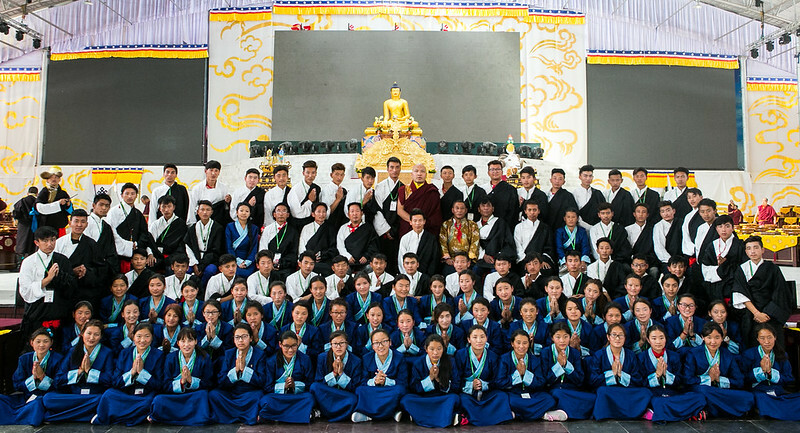 Each year senior students from Tibetan Children’s Village Suja, in Bir Tibetan Settlement Himachal Pradesh, come cheerfully to Bodhgaya to serve at the Kagyu Monlam. These are the Monlam’s Dharmapalas, the protectors of the Buddhadharma. Their numbers have grown over the years as their duties have expanded and their invaluable contribution to the smooth running of the Monlam has been recognised. This year 100 students have come, equally divided between boys and girls. The youngest is fifteen years old and the oldest is twenty. 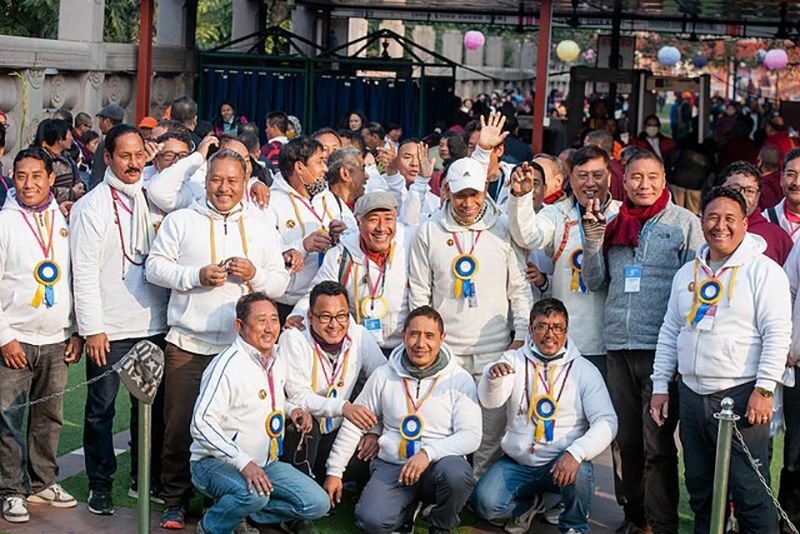 Their main responsibility is supporting the work of the security team; they help run the check-points and supervise all the entrances to restricted areas within the Monlam Pavillion. 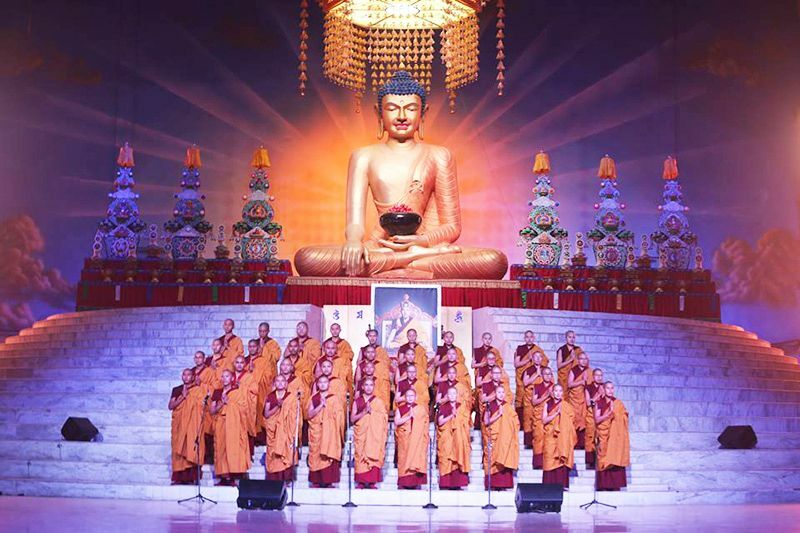 In addition, when the stage has to be changed for the next puja, they will be there, helping the young monks to heft heavy furniture or moving mattresses and seats. But you will also see them interacting with little children, fetching chairs for the elderly or helping to push someone in a wheelchair to a better place where they can see the stage, and generally helping out. The motto of the TCV school organisation is “Others before self”, and these young people can truly be said to put it into action. Each year they form an important part of the Garchen, the Great Encampment of the Karmapas, and have their own allocation of six large blue tents. Inside each tent, students have individual net tents to protect them against the mosquitoes which plague Bodhgaya and carry malaria. It is difficult to conceive of the situation in which many of these young Tibetans find themselves. The majority of them have come from Tibet in order to have a better chance in life and a comprehensive education. In order to do this, they have had to make great personal sacrifices, leaving behind their family, their friends and the way of life they knew. Tsering is also from Lhasa. He told how his mother had brought him to India when he was only five years old because the situation in his family and in Tibet was not good at that time. He is now eighteen years old and has only had contact with his mother once during those thirteen years. He has no other family in India, so while he was growing up, school holidays were particularly difficult. Other children in his hostel had relatives to visit during the long two- month winter holiday, and with whom they could celebrate Tibetan New Year. But Tsering and those without relatives in India had nowhere to go. They had to stay at school. 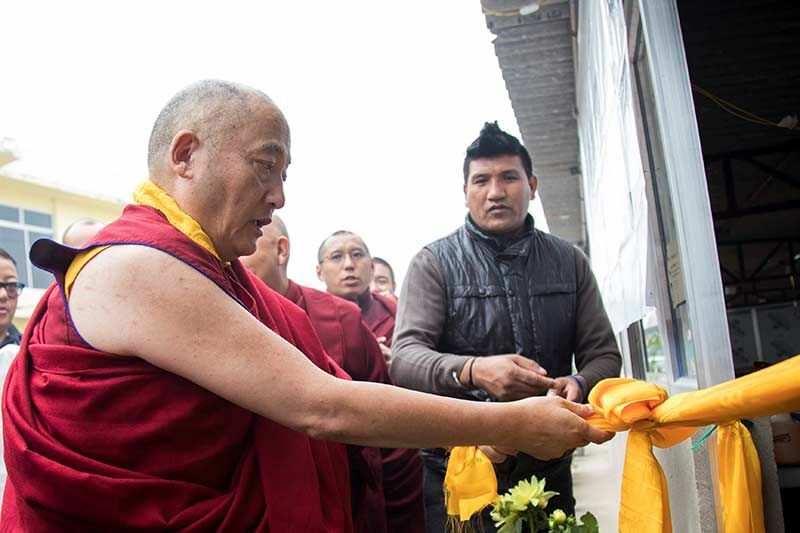 He praised the housemother in his hostel who had been like a real mother to him, and also the Karmapa, who has taken such an interest in the young people at Suja School. 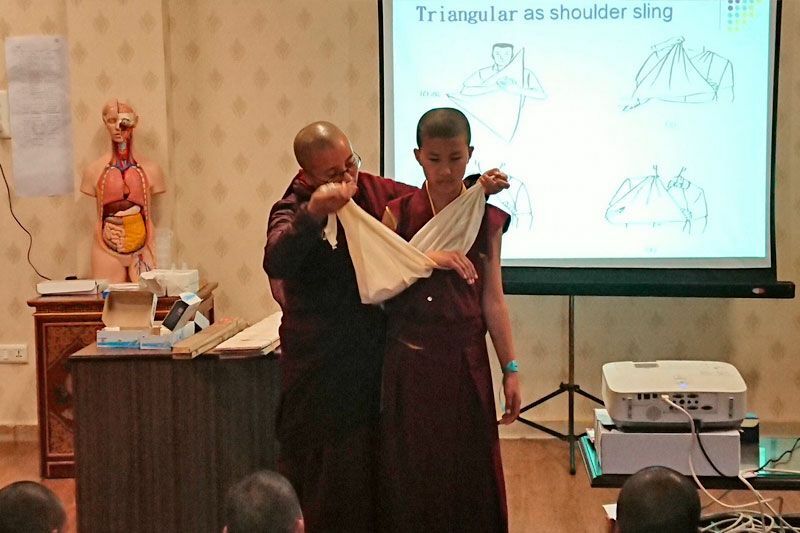 “He visits every year and stays with us,” Tsering said proudly. “He speaks with us, and he really cares for us. He has made it possible for me to have a holiday in this sacred place.” This is Tsering’s third and final year at the Monlam. Next year he will have to stay back to study for his school leaving certificate examinations, with the hope that he will do well enough to win a scholarship to university. For now, he is just exceedingly happy and full of gratitude that he was given the chance to come yet again to Bodhgaya and didn’t have to spend the winter holiday at school. On the first day of Losar, the Dharmapalas had to be on duty by 3.00am as monks, nuns and laypeople arrived for the 4.00am puja. Each had received a special Losar gift from His Holiness the Karmapa. The boys now wore a new chuba in heavy black brocade and long-sleeved white silk shirt. The girls wore traditional, sleeved chubas in deep blue brocade and subtly colour-coordinated with pale- blue silk blouses. 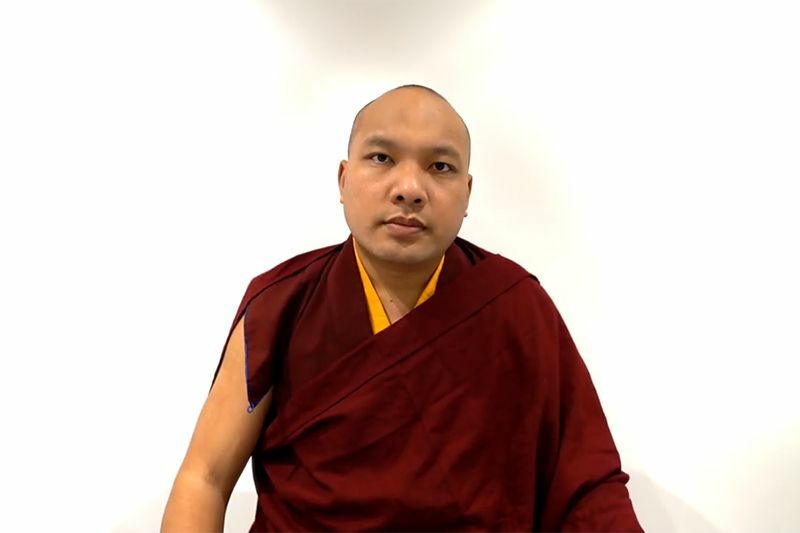 These clothes will be theirs to keep; an expression of the Karmapa’s gratitude to them for their service and an acknowledgement of their shared experience as child refugees, cut off at a young age from home and family, ‘strangers in a strange land’.